Before this past weekend, I have had the opportunity to drive two different A4 allroads. The first time was one of the two Euro-spec A4 allroads that Audi Wilsonville had for a short while; and, the second time was in a US-spec version of the car that I got to test drive when I was at Audi Exchange. Both drives were short test drives, just enough to get a feel of each one and to snap some photos. Over the past couple of months, I had been wanting a bit more than just a test drive of the A4 allroad. It isn’t just that I want to drive any and all Audis that I can; but, I had been considering an A4 allroad as a replacement for my 2004 A4 3.0 quattro saloon, which my mom uses as her daily driver, in about 18-24 months time. Why would I consider an A4 allroad as a replacement for my B6 A4 saloon? The biggest reason is that I wanted an Avant of some kind to regain some of the utility that I lost by moving to my S5 coupé. I also really liked the design of the A4 allroad, particularly with its body cladding. Also, unlike the facelifted A4 and A5, the A4 allroad keeps the round fog lights. The combination of the round foglights, the angular grille and new LED DRL headlights give the nose a pretty unique look. 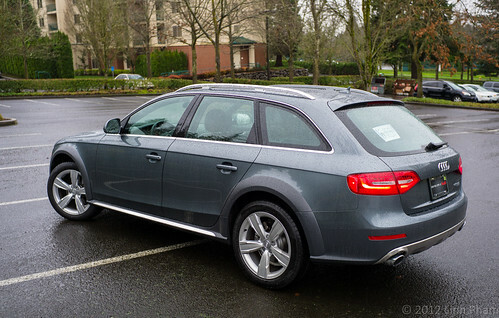 Last week, Audi Wilsonville had an A4 allroad loaner available for the weekend. It was a Monsoon Gray 2013 in Premium Plus trim, with MMI Navigation, advanced key, and the Bang & Olufsen sound system. For the interior, it had Chestnut Brown leather seats and the Fine Grain Ash in natural finish inlays. Since I picked it up on a Friday afternoon, I wanted to avoid the highways and freeways at all cost; so, I took the long way back home. Having taken Wilsonville Road and Highway 219 home when I had the A7, I opted to cut over to Borland and swing past Tualatin before heading north to home. As the allroad did not have the Sports Interior package, there were no flappy paddles. The next best thing was to keep the gearbox in S mode as much as possible, to prevent the gearbox from hanging on to 7th and 8th gear. If left in D and climbing up a hill, it does love to hang on to 7th or 8th gear until you slam on to the accelerator. During the drive, I was reminded of the smooth and light steering feel that the allroad had. For everyday commuting and long stretches of freeway, it is probably for the best. At higher speeds, the steering does firm up a bit, but still has a pretty numb feel. Although the A4 allroad that the non-sport four-spoke steering wheel, thickness of the wheel was just perfect and at least felt nice while gripping the wheel and navigating the twists and turns. Driving the allroad over the next couple of days, I didn’t really notice the extra ground clearance that the allroad has over the, now discontinued in the US, A4 Avant. Where I did notice it was when getting out of the allroad, particularly in contrast to getting out of my S5. Even with an obligatory trip to Costco and to several grocery stores, I could only fill about a quarter of the rear cargo space. Like the A7 that I had a couple of weekends ago, Premium Plus and Prestige A4 allroads come with a power liftgate. And, just like the A7, the power liftgate does take its time opening and closing. In case you forget that it is a power liftgate and try to close it on your own, it will detect that and the power liftgate takes it from there. Another feature that liked was the panoramic sunroof with the electronic shade controls. Even on a pretty dreary day, the amount of light that it lets into the cabin made the A4 allroad feel roomier and more airy that it really is. 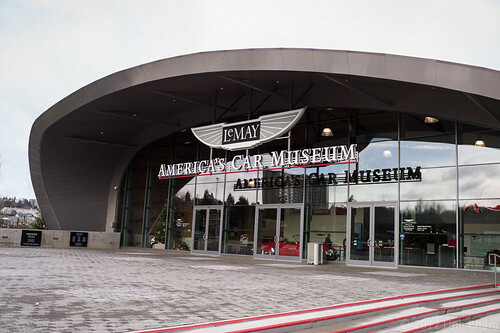 On Monday, I decided to take the A4 allroad on a day trip up to the LeMay Museum in Tacoma, Washington. Out on the open freeway, the A4 allroad just ate up the miles without any whinging. The ride was relatively smooth when compared to my 2004 A4’s sport suspension or the harsher S5’s suspension. Unlike some other luxury crossovers, the ride showed no signs of being floaty. You can feel some of the bumps, particularly those between Olympia and Tacoma, but nothing that would cause the stereotypical American Big Gulp to slosh around. Before going on the day trip, my mostly city driving netted trip averages of between 17 and 19 MPG. With a 50/50 mix of city and highway driving, I could easily hit 24 MPG. According to the trip computer, my drive up to the museum, out to lunch and back home, a total of just about 330 miles, showed an average of 28.1 MPG. There was no hypermiling involved and I would regularly toggle the gearbox into S to pass cars or have a little bit of fun in city driving. The only part of the drive that wasn’t exactly fun with the outright downpour of rain or rain/snow mix on the way back to Portland. Even with the extremely wet road surface and ruts, the A4 allroad drove confidently. When I took the A4 allroad back on Tuesday morning, the floor of the Willamette Valley saw a bit of snow. 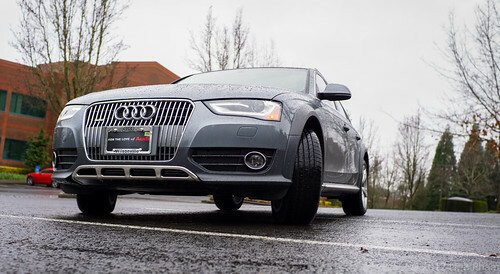 Unfortunately, not a whole lot of it really stuck on roads that I took back to Audi Wilsonville. Earlier in this blog post, I had mentioned that I have been thinking about getting an A4 allroad to replace my 2004 A4. After having the A4 allroad for the extended weekend and after having my mom drive the A4 allroad, we came to the decision to no longer consider the A4 allroad. One of those reasons is that we decided that that A4 allroad is just a bit too large for our needs and there is that extremely bitter and jagged pill: the cost. The A4 allroad that I drove for the weekend, with all of its options, has a sticker price of $49,070. The A4 allroad optioned out similarly in Glacier White, without the Bang & Olufsen sound system and adding the Sports Interior Package would still end up coming in at over $48,000. Yeah, that would be an extremely painful pill to swallow. There is also the fact that under normal driving conditions, the A4 allroad would only net 1-3 MPG more than my current A4. So, after three days with the A4 allroad and some a fair amount of thinking, my mom and I have decided to wait for the next A3 and hope that we will get the Sportback. If it does come and includes both the 2.0TDI and quattro, we would be sold on it immediately. Unfortunately, it doesn’t seem that the Sportback will come over in such a configuration, if at all. Neither my mom or I will consider any kind of crossover, be it a Q3 or a Q5, nor would be interested in the A3 sedan. If worse comes to worst, we may not get an Audi to replace the Audi A4. With the prospect of other diesel options that will be offered from BMW, Mercedes and Volkswagen in the coming years, it will be hard to stick with Audi if they (and the US) continues to shun sportwagons and sportbacks. For those interested in plunking down the money required to purchase an Audi A4 allroad, it is a pretty decent package overall. To me, the price premium, which I’ve gone over here and here in detail, over the previous A4 Avant and the Q5 makes my stomach go a bit uneasy.